The literature of the last three decades is replete with automatic methods for retinal image analysis. Acceptance has been limited due to post-processing or tuning requirements that may be just as time consuming as the original manual methods. The point of view herein is that by taking advantage of the human visual system and expert knowledge from the outset, the promised efficiencies of digital methods can be achieved in practice as well as in theory. Thus, simple labeling of regions of interest that is accepted and easily performed in a few moments by the human can provide enormous advantage to an already well-developed algorithm. 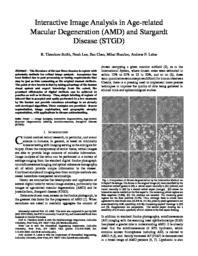 Three examples are provided: drusen segmentation, image registration, and geographic atrophy segmentation, with applications to disease understanding. Conference Record of the 42nd Asilomar Conference on Signals, Systems and Computers: October 26-29, 2008, Pacific Grove, California (Piscataway, N.J.: IEEE, 2009), pp. 651-654.